I configured Flirc to control the Sunrise TV Box UHD (Swiss internet provider). This box is manufactured by Sagemcom (DIW384 UHD) and is controlled by a bluetooth remote. The keypad can be programmed using the Flirc application and by simulating a standard keyboard. You can use the config file without learning the commands (they are saved in the flirc config file). Connect the Flirc to the usb port of the sunrise tv box. Make sure that the harmony hub can send the IR signal to Flirc dongle. I thank you very much for sharing your config file! As I don't have an HID keyboard, I cannot add number 0 to 9 in your config file. Could you add those command line functions? 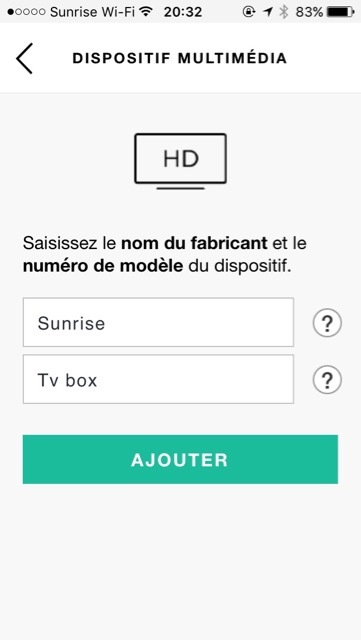 You can import the config file and plug back the flirc to the sunrise UHD box. The file work for the Logitech Harmony HUB by simulating the old Sunrise TV Box that have the IR remote. Thanks for the file. Unfortunately some commands are missing. It lacks the STOP, RECORDINGS and the BACK button. Despite my efforts, Ido not get to bring the keys to run. I hope you get it. There is no stop button on the sunrise remote. I found the right (for me!!) command for record. Thank you for sharing your work with the community. I connect my Flirc USB to my computer. I open the Flirc app. The app upgraded the firmware of the USB key. I go to the menu File > Load configuration and I select your file "Sunrise_Flirc.fcfg"
The app confirmed "File restored". 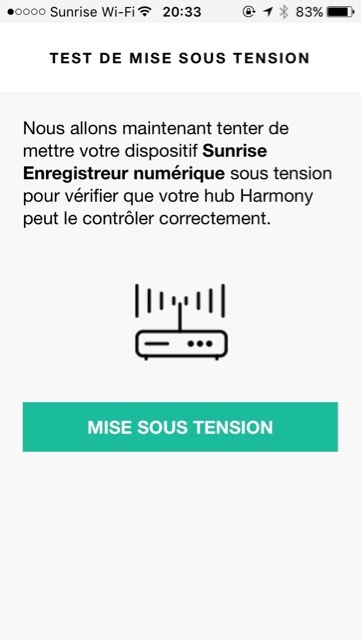 When the Harmony app tries to turn on the device, it doesn't work. I checked that one of the IR emitter of the Harmony Hub is placed in front of the Flirc USB. Zwickel found that the command can be different for the recording. I don't know if there is difference in the Sunrise UHD TV box soft. You can try replacing the command 48 by the numbers next to it. Je suis comme Christo976. J'ai fait toutes les étapes de l'installation. Mais rien ne se passe, la TV Box ne s'allume pas. J'utilise une Harmony 650, sans HUB. I'm like Christo976. I did all the steps of the installation. But nothing happens, the TV Box does not turn on. I had some problem with Power On and Power Off the Sunrise TV Box UHD also. I tried to change flirc_util record_api 48 102 by 47 or 49 but it didn't work. In fact, the Sunrise box was powering on but I couldn't get any sound or image. I realised that my A/V receiver (Onkyo TX-NR-535) was bugging the Sunrise Box (especially when powering off). Despite I deactivated all "HDMI through" function of my devices, or even when I activated them, it was still bugging. I changed like that now: Sunrise TV Box UHD <-HDMI-> TV <-Optical-> Onkyo. So for now it works. But I don't know if I could get Dolby Sourround or DTS sound in that configuration. All this to say to check your A/V receiver if you have one and make some trials by bypassing it. The power command woks for my config but I keep the sunrise TV BOX always ON and switch OFF only the TV when I end the Sunrise activity in the Harmony config. I use this config because my TV and the the sunrise TV BOX are sometime desynchronized (one is ON and the other is OFF) when the activity start or end. So if the others commands works, you can just switch ON the sunrise TV BOX with the sunrise remote and keep it always ON. I tried to power off only my TV and my A/V receiver but as soon as I power on them, I lost the image on my Sunrise TV Box UHD. I don't why, my A/V receiver sends a signal to my Sunrise box and my TV despite I deactivated this kind of feature. It is working quite well. But the Recordings function is still missing. I want to have it on the DVR button of my Harmony Ultimate remote. Hello and thanks a lot for the help, my sunrise uhd box is partically working, but unfortunately is my „back“ button not working as it should. in the menu i can exit with the back button on my harmony elite, but i can‘t go back in menus where it shoud really trigger the „back“ command and not the „exit“. i already tested some settings by the line command and record_api, but i never get the right record_api numbers in the command line. what‘s the best way to get the right number for the command? Hello, thank you for your answer! i tested numbers from 1-110 and will test more in the next days, i already found a lot commands but not the specific back button. maybe i will post my experience with all the numbers here. 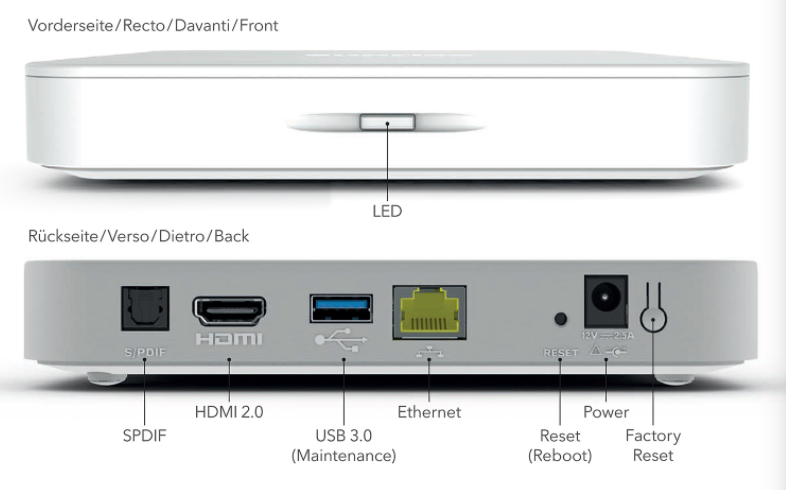 With the above informations I could manage to run the Sunrise TV Box with the Harmony Elite. The only thing I had to change, was the command for the recordings. Did anyone find out the command for the "Teletext"? Use the command "flirc_util loadconfig"
In the harmony settings use the old sunrise box as device to send the command.